Merry Christmas; God bless us everyone! Finally! I have completed all my challenges this year right on time! 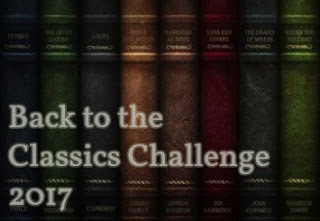 I still have Dickens at Christmas to read for Dickens in December 2017, but it does not count as challenge. I will just enjoy my Christmas holiday with Mr. Dickens. 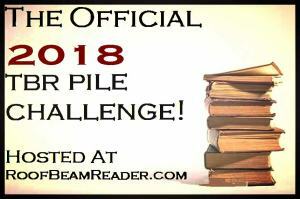 What makes me proud of myself is that I successfully wrote reviews for ALL books for these challenges—even if it’s only mini reviews—which I failed last year. Here is the complete list, and I thank all the hosts for encouraging me to read many inspiring books this year! Jarndyce and Jarndyce was a legal case with a long history in the Chancery court. 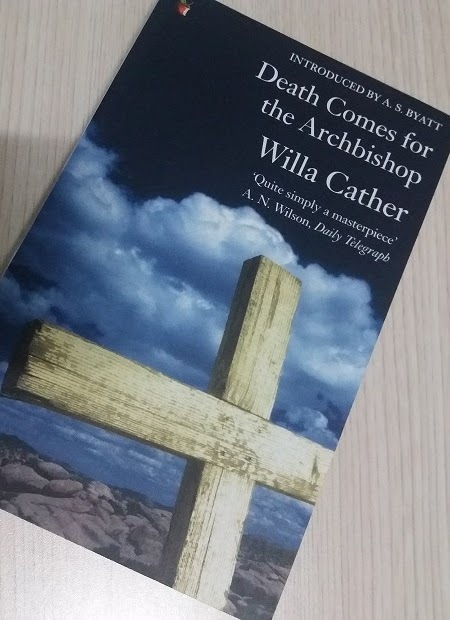 It's about a conflicting wills which affected many people of several generations and ruined many of its suitors’ lives because of the corrupted law system. Of the many victims are John Jarndyce, the owner of Bleak House, the two orphaned cousins Richard Carstone and Ada Clare, and Lady Honoria Dedlock. Together with another orphan girl which became John Jarndyce's ward: Esther Summerson, they become the leading characters of this book. 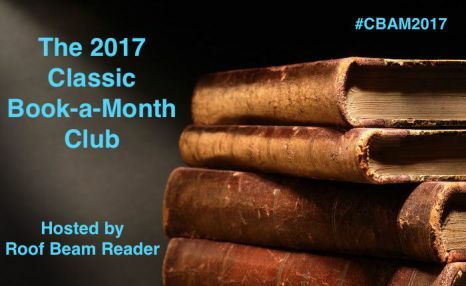 Dickens wove the story using voices of two narrators with different character: Esther Summerson's—calm and reserved, and the omniscient—rather cold and severe. This makes Bleak House less dull, but still I missed Dickens' warm and affectionate voice he used in several books I have read so far. Unlike his other books, Bleak House was built by several plots or subplots which are often unrelated to each other, but for the (abundant) characters. The Jellybys and the Turveydrops, for example, are not really related to the others, except Caddy Jellyby who are so fond of Esther Summerson. 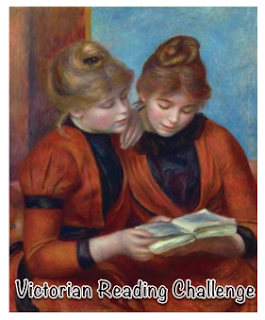 Is it only Dickens's way to highlight Esther's amiable and unselfish character? But what about the Dedlocks? Lady Dedlock is another prominent character here, but although she was also suitor in the Jarndyce vs Jarndyce, her part is not related to the law suit; which made me thinking what purpose does she really bring to us, reader? Speaking of Lady Dedlock, she has become my favorite character of this book. From the moment she went to the burial ground, disguised, guided by poor Jo, I have said to myself: here is a brave, strong, smart woman with a steely determination underneath her elegant bearing. Compared to Esther Summerson or John Jarndyce, Lady Dedlock seems more humane, and thus more prominent. For a distinguished lady who had a dark past, how she could bear it bravely alone… that’s the real heroine to me. Esther and, especially, John Jarndyce are almost like fairytale’s character. Can one be THAT unselfish and always perfectly kind like Jarndyce? I would have loved him to be selfish, at least when his love was concerned, but for his lover’s happiness, he’d reluctantly give way to the man she really loves. That would be much acceptable. 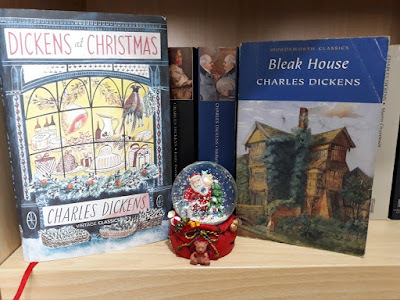 But, it’s Dickens anyway, and despite all that, Bleak House was loveable and memorable. Oh, I forgot to mention Harold Skimpole, who, to me, was the WORST antagonist of all time! How can that kind of person ever exists in the world, I can’t imagine. Well, enough for the rants... I would have given Bleak House five stars just for Lady Dedlock’s sub-plot. The search by Inspector Bucket and Esther is so thrilling. And I could see whence Hercule Poirot’s investigating style was inspired—his casual talking to extract facts innocently, his systematic pattern of search (and his cool way to do it), and the way he confront the accused by shaking his/her emotion in front of others. Now, that part deserves five stars, but Esther’s narrative and the Jarndyce and Jarndyce are rather dull and unreal. 4,5 of 5 is my best compromise. Hello Dickensian… we are almost midway through #DickensInDecember2017! This is where you can link-up your posts or reviews. 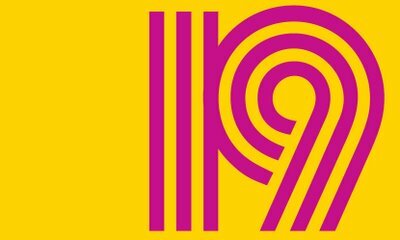 The linky will be open until January 12th, in case you could not post your reviews in time because of the Christmas buzz or even New Year’s hangover. Now, tell me how have you been with your Dickens? Are you in the middle of it? 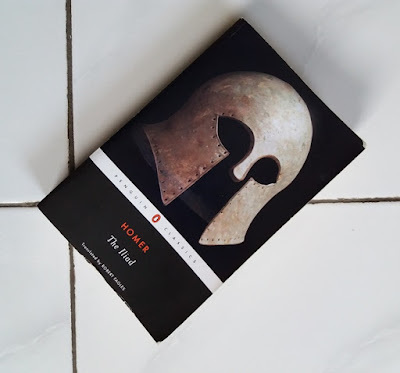 What book are you reading? Have you watched or do you plan to watch any Dickensian movie/series? 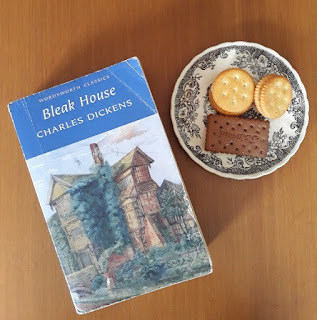 Right now I am about 60% through Bleak House, and really enjoying it. 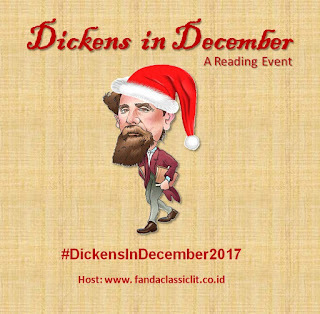 Hopefully I can finish it this weekend, so that I can welcome the festive season by reading Dickens at Christmas. I also plan to watch Dickensian series during holiday. What about you? Now, let’s hope nothing huge and unexpected will happen next year, so that I can read and blog calmly throughout the year! 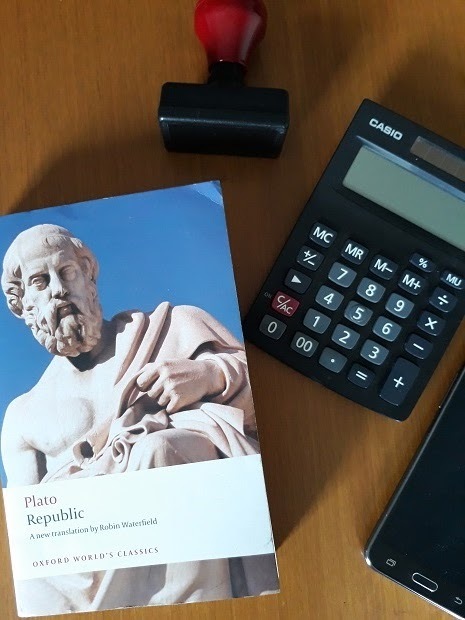 If God does not exist, then everything is permitted—this seemed to be the central point of argument Fyodor Dostoyevsky brought up in The Brothers Karamazov. Originally intended to be a trilogy, he wrote this amazing book to follow the life of a notorious family, the Karamazovs; from the father: Fyodor Pavlovich, to the three (legitimate) sons: Dmitri, Ivan, Alyosha, and (most probably) illegitimate son: Smerdyakov. They are entangled into an intricate love-suspicion-jealousy-hatred relationship throughout the story, which lead to destruction both to (most of) themselves and to people around them. So, how did Dostoyevsky put the above argument into this nicely-woven story? From the beginning the doubt and rejection of God and immortality scattered throughout the chapters. But the most serious one is in these two famous chapters: “Rebellion” and “The Grand Inquisitor”. In “Rebellion” Ivan poured out his disappointment of God for letting injustice and suffering happened to innocent people, apparently, for nothing. While “The Grand Inquisitor” is a poem Ivan wrote to question about free will God had imposed upon man. He believed that free will is impossible burden for mankind, because we will always have to answer to our consciences; that we will never be happy whichever path of life we choose, good or evil. If that was the case, then why wasting your energy by doing good? Is that true? 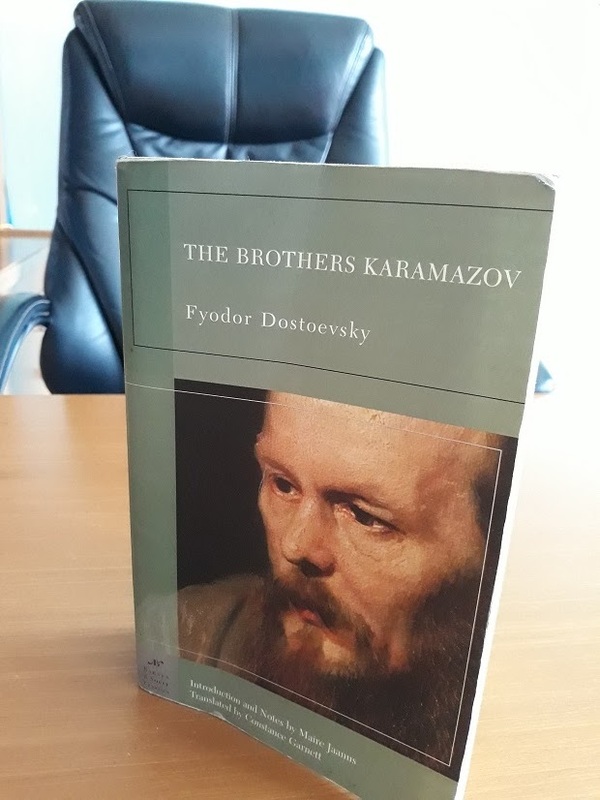 Dostoyevsky let us readers judge the case by following the faith of the Karamazov brothers. Of the three (plus one—the illegitimate) sons, Alyosha was the only one who chose “good” from the beginning. However, he too had doubt—albeit small—when his beloved Father Zosima’s corpse decomposed shortly after his death, while everyone was almost sure a miracle would happen to the saintly monk. But Alyosha soon got through his doubt. Dmitri, on the other hand, started as a scoundrel and sensualist; have plunge to the lowest, but finally managed to crawl up to the light. In the crucial moment, “something inside” ripped him from the fatal act—that is conscience. But the most interesting case is Ivan. His “conversation” with the Devils shows how strenuous the battle of his conscience was; how bad his soul has been contaminated by evil power. Ivan was not atheist; he just did not accept God’s “interference” in human life; hence his belief of if God does not exist, then everything is permitted. That way, so he believed, man could do whatever he likes without weighing his conscience, and that would make him happy. This ideology eventually provoked a murder, and Ivan did suffer from his conscience. I’m glad though that in the end his good conscience won the battle at the end. Moral value of this book is, that man must try first to understand God’s plan for humankind; and this must not be done with mind only, but much more with reflective soul. To logical mind, conscience did make one suffer; either when he tries to be good or, even more, when he does evil. And to be good is arduous, especially when one is born from a bad family like Karamazovs. What then? Dostoyevsky answered this by writing quite lengthy passages of Father Zosima’s speeches in the early chapters—which, I confess, seemed not to be related to the story when I read it, but made sense in the end. These passages contain some aspects that were missing from Ivan’s ideology: humility, and “all responsible for one another”—the later applied not only in evil, but also in love or good deeds. Young Zosima’s turning point moment was marked by his humility to his servant whom he has beaten the night before his planned duel. The same worked for Alyosha. Remember how Alyosha, when he was disappointed at Father Zosima’s humiliation, went to Grushenka’s, and what has made him turning toward “light” again then? Is it not after Grushenka pitied him; that Alyosha was astonished that she had pity on him—he who was nobody? Is it not a remark of humility too? Lastly, the remark of all responsible for one another appeared in Ilusha and the children story. Ilusha’s sorrow was caused by Dmitri is an example of how one evil deed to one person might cause suffer to a lot of people. The same also applies to love and good deeds. So, Ivan’s ideology might partly be right; that free will could cause suffering. But on the other hand, it is also true that from freewill too love, charity, affection, and in the end happiness, was born. 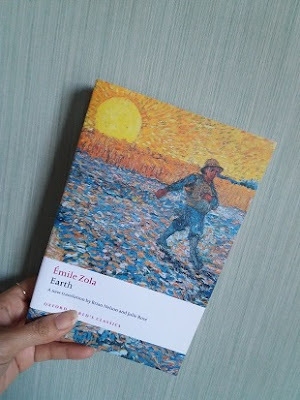 5/5 stars for this great book; I would like to reread it someday! As usual when the last three months in the year is coming, hectic is all around me. I still can catch up with my reading pace, but not with reviews. 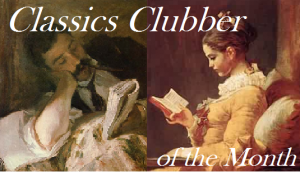 So, here are my mini reviews of two books I have finished—the eighth and ninth of my second The Classics Club challenge (three more to go for this year!). This is my first Orwell; 1984 will be following soon. It is an allegory of Stalinism—a concept I have had, until now, only a vague notion of. Orwell wrote it to satirize Joseph Stalin, with whom the UK was in allegiance with when the book was published (1943-1944). Orwell did his job well, anyone who read it would clearly see the message, and the fable is convincing and entertaining. I have only one question: What has become of Snowball? While the end of the fable was quite predictable, Snowball’s condition was one thing I looked forward to when approaching the end. But that was not the main focus of this book, of course. 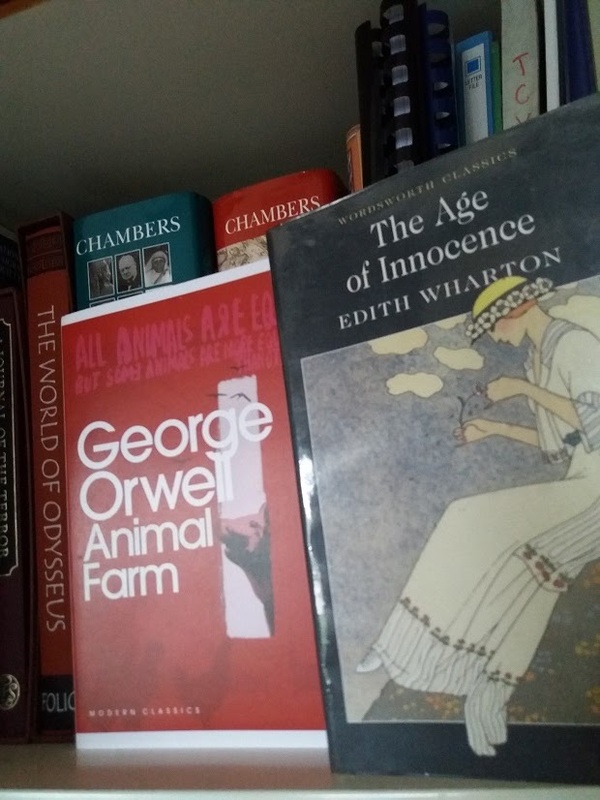 All in all, four of five stars I granted for Animal Farm. It is not striking, but quite inspiring and entertaining, and definitely well written. I have no idea what criteria make a book earning Pulitzer Prize; but to me Wharton’s The House of Mirth is much finer than The Age of Innocence. The story is about old vs modern world of New York society. My favorite character is Countess Ellen Olenska. She is genuine, kind, and brave. She sets the example of being modern woman without compromising her conscience and integrity. Maybe she was to be the “victim” here, just as Lily Barth in The House of Mirth, but my sympathy, instead, is more for Newland Archer. I think he was the real victim; he was dragged by the old and the modern New York. Unlike Ellen, it seems that Newland doesn’t have a firm ground to stand on. And the ending is so devastating. I can’t imagine having a life like Newland’s: dry and hollow… for the rest of his life. All in all, it is not as I have expected, but still a treasure. Four of five stars. Chapter five – Gatsby’s offer to “pay” Nick for his favor made me think that apart from his choice of getting rich, Jay Gatsby is quite a nice person. He is very polite, hate of asking favor from friends (his intricate ways in asking Nick to arrange meeting with Daisy), and he is the only one who doesn’t drink. And when he loves a woman, he respects her, and is loyal to her to the end. According to Careless People, T.S. Eliot’s poem The Waste Land has major influence in Fitzgerald’s ideas for writing Gatsby—not the plot, but the general theme and atmosphere. I have never read Eliot, and this can be my good excuse to mark him. Now, I have mentioned in my previous post about Gatsby as a “novel noir”. So We Read On dedicated a chapter titled Rhapsody in Noir to discuss this; and it’s very interesting. First of all, the origin of Gatsby’s real name “Gatz” is gat—a slang for ‘gun’ in the twenties. There are at least three deaths caused by gun in this story. And don’t forget the car crashes that happened too many in such a short story (including Tom Buchanan’s which then revealed his affair with a chambermaid only a week after his marriage with Daisy!). Add it all with the desolate valley of ashes, the abandoned billboard of the oculist, and Wilson’s shabby garage. 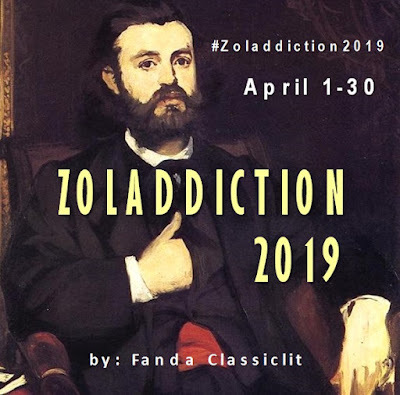 Yes… this is not a romantic story of unrequited love or the lost of illusion; it is the gloomy image that Fitzgerald felt was happening in America—emptiness and deadliness. Corrigan even questioned about Myrtle’s accident: “Who can say for certain whether Daisy’s hit-and-run murder of Myrtle, her husband’s mistress, is just an accident or a subconscious homicidal drive realized?” Yeah… that has made me shiver a little! And horrifyingly, it made sense to me. Gatsby-Daisy’s reunion is full of emotion. Daisy was crying, but for what? Remember when Gatsby thrown his colorful shirts and Daisy cried? Of course she’s crying not because she has never seen such beautiful shirts before, but I think, because she lamented her faith of being a wife of the brutal man: Tom. If only she had waited for three more years, she would have had a rich AND loving husband: Gatsby. But after their trip, where Tom confronted Gatsby, and Gatsby persuaded her to flee with him, I think Daisy got so confused… and drunk. I think she realized that Gatsby would never fit in her circle—no matter how she loved him, her husband would always be Tom. But then seeing his mistress on the road… I don’t know whether she knew about Myrtle or not—probably she did—but that is enough to lead her to Corrigan’s homicidal theory. I am still wondering about the history of Gatsby’s mansion which Nick told us, particularly this passage: “Americans, while occasionally willing to be serfs, have always been obstinate about being peasantry”. To what exactly did Fitzgerald want to allude with it? What do you think? Chapter four and five are awesome! Chapter five, especially, as this is where Gatsby-Daisy reunion took place. They are short, but hey!...there are so many interesting things I want to share, that I decided to only pour out my thoughts on chapter four in this post, and will write another post for chapter five. Here are my personal notes from the book itself and two companion books that I am reading along with Gatsby. 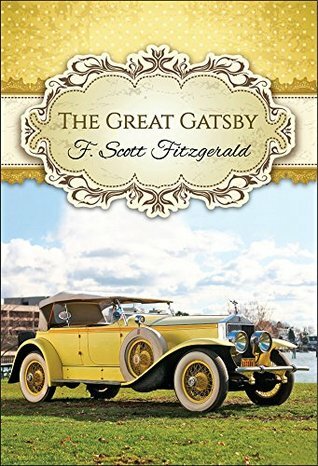 Chapter four -- The big question that arose from Gatsby’s and Nick’s chatting on their trip to New York for lunch is whether Gatsby was boasting or telling the truth, when he told Nick about his background. Fitzgerald never told us the truth (what is exactly Gatsby’s business, for example? ); Gatsby remains a mystery. I think some of what Gatsby told Nick might be true, but the way he boasted it made Nick think he’s lying. Fitzgerald also boasted often in parties he was invited. It’s rather touching to see them—“nobody from nowhere”—in their struggles to climb the social ladder, not to be regarded as nobody. On the same trip to New York, Nick laughed when “some negroes in limousine rode passed them with haughty rivalry”. This is the second time I noticed a bit of racism in this book, but maybe at that time, it’s not counted as racism. It’s just to show how Fitzgerald—or the American—felt that the nation was on the brink of changes, and that “everything is possible”. The hearse that also passed them creates a dark atmosphere into this story—something I have not realized until Sarah Churchwell labeled Gatsby as “noir novel” in Careless People. And to think of how many tragic deaths that had happened or told in the story; not only of Myrtle, Wilson, and Gatsby, but also “Rosy” Rosenthal—apparently a real person—of whom Meyer Wolfshiem witnessed the shoot. Careless People revealed to me that Gatsby and Daisy are inspired by Fitzgerald’s (unrequited) love story. Young Scott was in love with Ginevra King, one of the rising debutantes in pre-war Chicago. Ginevra rejected him and later married a wealthy young man from her own circle. Fitzgerald took it that she discarded him because he was poor. Only on my second careful read of Gatsby that I realized how Daisy’s feeling about Gatsby and Tom. On her wedding dinner she was torn between love and money (she chose love when “drunk like a monkey” but eventually picked money after cooled up and could use her logic). 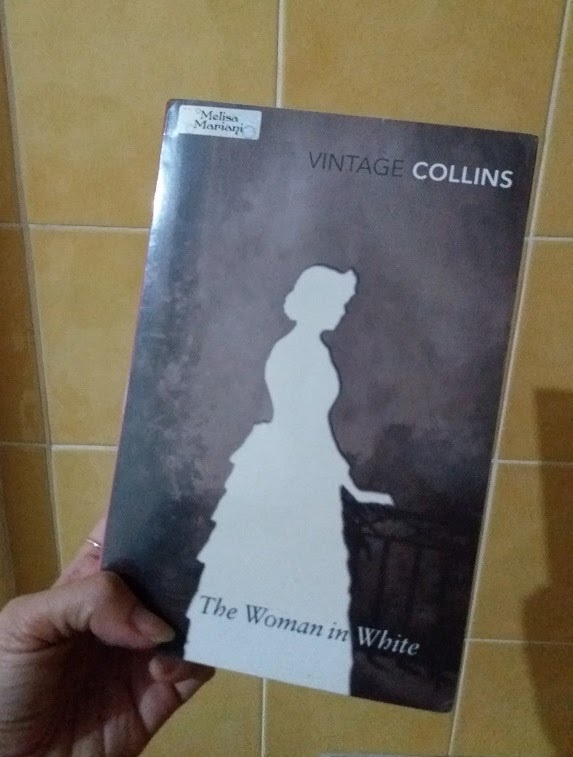 I wonder about the final paragraph of chapter four: “Unlike Gatsby and Tom Buchanan, I had no girl whose disembodied face floated along the dark cornices and blinding signs...” What does it mean? The last few days having been hectic, and I didn’t have time to write about second chapter. So, this time (and maybe until the end of this readalong) I will compile few chapters in one post. Chapter 2 is all about the green light and ash heaps (the valley of ashes). Sarah Chuchwell, in Careless People, argued that the green light, toward which Nick has seen Gatsby stretched his hand, was probably inspired by the confusing new traffic signal in New York in 1922. The traffic signal tower that had newly been built on Fifth Avenue used “green” to indicate “stop”, while in any other railroad signals, green always the sign for “go”. This eventually led to many accidents. Fitzgerald could have used this phenomenon to write the famous gesture of Jay Gatsby’s stretching hand towards the green light—it might be that Gatsby misread the green lamp as permission to proceed, when in reality it told him to stop. What do you think? Fitzgerald’s the valley of ashes might have been inspired by the Corona Dumps, the mountainous mound of fuel ash on a swampland beyond New York City—it was halfway between New York and Great Neck. These dumps, I imagined, created a contrast between the glamour of Manhattan and the grime of ashes, refuses, and even manure. The 1922 was said to be the age of advertising, when billboards could be seen throughout the city. And in the midst of these ashes Fitzgerald has placed the Dr. T.J. Ekcleburg billboard. Until now I have assumed that the giant eyes are the eyes God, but Sarah Churchwell offers other possibility: it could represent the new “god” that the New Yorkers worships: advertisings. It is indeed in accordance with the whole theme of Gatsby: illusion. I don’t know… I still have to think about it. 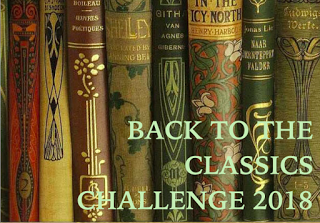 Chapter 3… finally, we met the enigmatic Gatsby! Nick attends Gatsby’s glamorous party and has been curious about his host. 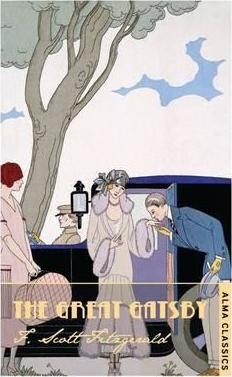 But when finally meeting him, Nick is surprised to learn that Gatsby is not what he expected. From the glamorous party, Nick expected Gatsby to be a “great” man, but in reality he is just someone who wants to look great—“an elegant young rough-neck, a year or two over thirty, whose elaborate formality of speech just missed being absurd”. The party reflects the heart of the Jazz Age, the Roaring Twenties. After the depressing war, people are restless; they do not know what to do; just want to be amused. Just what Daisy is in chapter one—laying on the sofa with Jordan, and later on when Gatsby visited the Buchanans. But the same restlessness leads to carelessness. Jordan’s reckless driving, for example, and that is the portrait of New Yorkers at that time. Nick himself is restless when moving into Long Island—maybe partly to avoid having to break his engagement? Chapter two of So We Read On (Corrigan do not follow Gatsby’s structure) is about how New York City has attracted dreamers. It promised success and glamour, something greater and different, but it often ended up bad, and even destroying. There is also a sense of change in the air—cultural change. Immigrants were coming (for Tom: “Civilization’s going to pieces), and Americans does not know how to react or where it would be heading. Following recommendation in the preface of Careless People, I decided to read The Great Gatsby, Careless People, and So We Read On simultaneously. Following Gatsby, Sarah Churchwell also divided Careless People into nine chapters, developing her investigation of events around Fitzgerald, following the story development of Gatsby. She even titled the chapters according to Fitzgerald’s original outline list for writing Gatsby. I had also taken a glimpse of So We Read On (the Introduction)—it provides another side of background history of how Gatsby was produced. But for Gatsby, I decided to put double efforts. First I will read first chapter of Gatsby, then consulting the same chapter of Careless People, and some pages of So We Read On. Then I will use the insight information from both books to go back to Gatsby again. 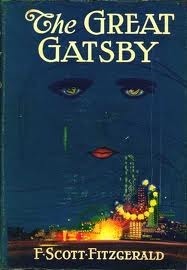 That way I hope to be able to understand more on the making of The Great Gatsby, and what has made Gatsby that great. In this part, I will share what I got from Careless People and So We Read On, or any new perspective on Gatsby, which I have got from both book. Nick Carraway is personification of Scott Fitzgerald in Gatsby. The resemblance is uncanny—in personal character (judgmental); in their way of thinking (luxury lovers, but also moralists who criticize its damaging effect). Interesting point: What does the green light represent? Dream? Hope? Or the color of money? We might have more suggestions on next chapter. Speaking of social class, Gatsby IS other (half?) personification of Fitzgerald. Gatsby and Fitzgerald are both victim of social class distinction—they were “Mr. Nobody from nowhere” who struggled to belong to the “old money club”. Gatsby has got the money (through very hard working, and even bootlegging), yet not the breed. 1st chapter of So We Read On also speaks about water references or symbols throughout the book. When combined with Sarah Churchwell’s investigation about the confusion on the green traffic light around 1924, the famous ending of Gatsby’s 1st chapter—Gatsby reaching for the green light—could have a new meaning. I’m not too sure about this, but let’s see. Reading the above two books has helped me to understand more on what Fitzgerald has tried to tell us through this masterpiece, for which he had given his total effort. 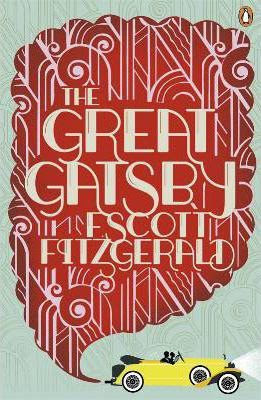 I began to see why Nick put Gatsby above all the rest, that “in the end, Gatsby is all right”, and furthermore, why “The Great Gatsby”. I have been wondering all this time, what is Gatsby’s greatness? He has a dream, works hard to achieve it—through shady businesses—but in the end still cannot reach it. Many people do that, even more honestly! But now I believe that the greatness lays more in the values that Gatsby (and Fitzgerald) believes. 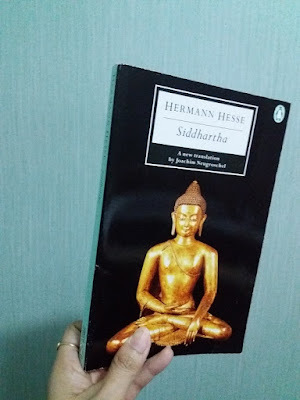 This is only my momentary reflection; I will come back to this later after completing the book. But this revelation excited me to delve deeper into this gem, and I can tell you that my admiration to Mr. Fitzgerald keeps increasing along the chapters! How far have you been?